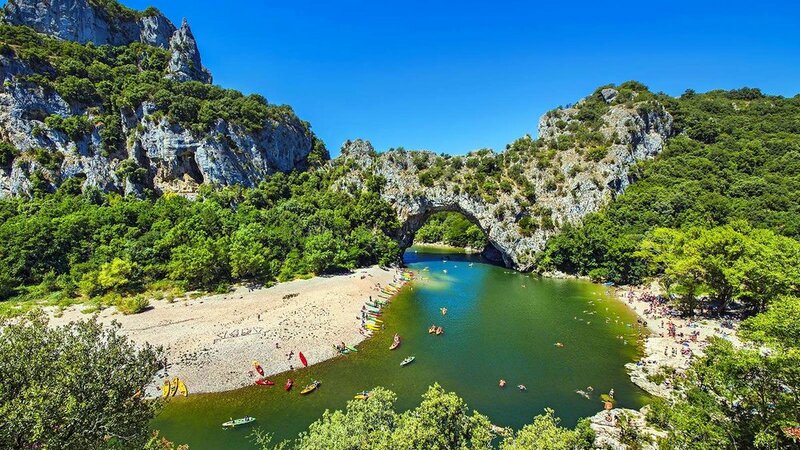 At the gateway to the Gorges de l’Ardèche, this natural bridge hollowed out by the river during thousands of years forms a natural arch of 60 metres in height straddling clear water to reveal an opening 30 metres wide. Swimming, canoeing or even hiking are recreational means to discover this wonder of nature. Considered as a authentic geological treasure in the eyes of visitors, the Pont d’Arc became a classified monument in 1982. This perimeter was extended in 2013 as part of protecting of the Grotte Chauvet (Chauvet Cave) situated a short walk from the Pont d’Arc. Curiosity of nature, this wood offers a wealth of fauna and flora. THE "RÉSURGENCE DE FONT VIVE"
Vauclusian resurgence below the village of "Le Chastelas", now ruined. Its clear waters, 9-10m deep, are surrounded by an oasis of greenery. A very peaceful, restful place. Winding between Villeneuve de Berg and Vallon Pont d'Arc, the Ibie Valley offers its magnificent landscapes combining limestone rocks and Mediterranean vegetation. This beautiful valley owes its name to its river: Ibie, a tributary of the Ardèche, which has dug its bed in the "plateau des Gras". The Pont du Diable on the Hérault River is one of many bridges in France with this name (it means Devil's bridge). It is located over a steep-sided gorge. To discover absolutely during your stay in Ardeche, the Pont du Diable can be the occasion of a hike, an excursion with family or friends, a picnic on the pebble beach in front of the bridge. You can sunbathe under the Ardèche sun, bathe in the clear waters of the river and enjoy the beautiful landscape of this valley. Not far from here, you can discover the "Gueule d'enfer" and the "Chaussée des géants". The Aven d'Orgnac site is located along the road that connects the villages of Orgnac and Barjac, a few kilometers from the the famous "Gorges de l'Ardèche". The Aven d'Orgnac is one of the most important in Europe because of its size and the richness of its concretions. Discovered in 1935 by speleologist Robert de Joly, the aven was quickly laid out and then opened to the public. Its beauty and its proximity with the Gorges de l'Ardèche have quickly made its success. The cave has been classified as Grand Site National since 2004. The guided tour of one hour makes it possible to contemplate 3 gigantic rooms to the hundreds of crystallizations with a sound and light in the room Red to conclude in this beautiful journey in the bowels of the Earth. A breathtaking tour, with 700 steps down to a depth of 120 meters. The ascent will be much faster and effortlessly in elevator. THE "GROTTE DE LA MADELEINE"
The Madeleine Cave opened in 1969 and has since been awarded three stars by the famous Michelin Guide. Follow our guides and discover a wonderful world created by water million years ago. The tour includes a great «Light and Sound» show! Located in an area of pure natural beauty the place offers various activities. You can visit the Cave or simply enjoy a fresh drink on the Madeleine fantastic viewpoint. You will also find a gift shop.. In the heart of the ‘gorges de l’Ardèche’, the cave of Saint Marcel d’Ardèche will transport you in an enchanting universe. You will discover huge halls and amazing waterbasins, unique in Europe. The site of the cave of Saint Marcel d’Ardèche offers you also a walk along a botanical poth called « le chemin de la grosse pierre ». Equipped with a GPS available (for rent) at the reception, you will discover the fauna and flora of the “Gorges de l’Ardèche” but also different distinctive features such as a menhir and a dolmen. The cave can also be discovered with speleologists thanks to trips organized by the society “Escale".